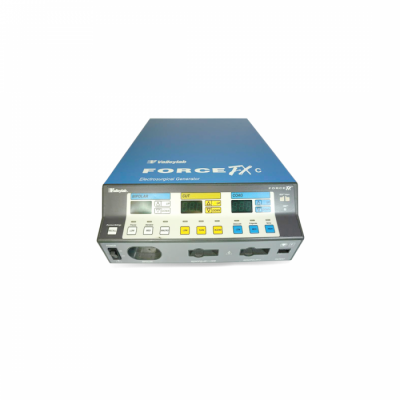 The Valleylab Force FX is a digital electrosurgical unit that optimizes performance on low power settings. It is used for both monopolar and bipolar procedures. This device improves precision and control during delicate surgical procedures and helps reduce collateral damage. The Valleylab Force FX has an Instant Response Technology that delivers constant power to ensure consistent performance on all tissue types. Operating at lower power settings, it minimizes risks of tissue damage and neuromuscular stimulation. It offers three cut modes: Low, Pure, and Blend; while its four coag modes are: Desiccate, Fulgurate (at high crest factor) and Fulgurate (at low crest factor), and Spray. Additionally, it allows three bipolar modes: Precise, Standard, and Macrobipolar. It is compatible with other devices such as Force Argon II and Cook Vascular Perfecta EDS pacemaker lead extraction system. It can be activated through its handswitch or footswitch.